If I haven't posted lately, it's not because I don't have anything to post about, it's just that I've been too busy doing them. Funny, it's so much easier to write about what I'm thinking of doing, and such a post this is. My second floor bathroom needs work. That's undeniable. The bathtub is marred, discolored, and drains like an Amtrak train waiting for a freight to go by; the pedestal sink, while cute, is inconvenient and its plumbing was installed crookedly and leaks; the vinyl flooring is worn and curls at the edges; the linen cabinet is beat up, with doors that keep coming off the hinges; the tile is outdated and the wallpaper is absurd. 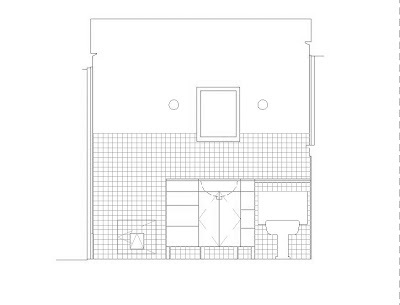 A bathroom remodelling would be a glad and welcome event. The other undeniable thing is that I am broke. Great credit still, but broke. I won't go into the gory details, but I do not have the funds lying around at the moment to redo my bathroom the way I'd like, or any way at all. But it's spring and the remodelling contractor johnnies have emerged in force, attempting to drum up some work. So just for grins, I've made appointments with two of these businesses, to see what it's liable to run me to redo my bathroom, someday, maybe next year, when it might not be so laughable even to think about it. Yesterday afternoon, then, a bloke came around from a firm I'll call First and Only Baths*. This guy was enthusiastic, I'll give him that. I have an idea about making a cat litter box cubby under the stairs that are on the other side of the bathroom's lavatory wall, and he was so taken with it that I had difficulty in getting his attention on to what else I'd like to do. And he had no problem with my intention to do the tiling, painting, and other finish work myself, leaving the heavy lifting items to them. But hmm, I have to wonder if this is a company I want to work with. When you've got drawings to show and the estimator still gets off on tangents about what you want to accomplish, what would you likely end up with? If you tell him you want something lined with Formica® or MDO plywood, why would he insist you should make do with stick-on shelf liner instead? If you've told him your tub drains too slowly, from what realm of fantasy would he import the idea to turn the head of the new one around so the drain line would need a greater fall from the plug hole to the soil stack? Why when you tell him repeatedly you'd need them to demolish and remove the tub, would he keep saying, "Oh, you can break it up if you want! We won't leave you with tub pieces at the top of your stairs!" And then there was his insouciance about the floor structure as is holding the ceramic tile and clawfoot tub I want to put in. I have pictures from February when the kitchen ceiling was opened up to repair the bathroom sink plumbing. I showed them to him. It's obvious that the span between joists is too great to allow ceramic tile without sistering the joists or adding support to them somehow. But oh, no, he dismisses that; oh, it'll be fine just the way it is! They redo hundreds of bathrooms! They put ceramic tile on floors like that all the time! I asked whether he thought the floor as it is would take the additional weight a cast iron clawfoot tub would add. "Why are you so worried about the structure?" he laughed. "Because I don't want my bathtub in the kitchen." He was very cheerful about simply taking up the existing vinyl flooring with its ¼" luan plywood underlayment, slamming down some HardieBacker® onto the 3/4" x 3¼" tongue-and-groove subfloor, then installing the ceramic mosaic on top of both. "Um," I ventured, "wouldn't you be putting down some exterior grade plywood first?" "Oh, no, we wouldn't need anything like that! We've been doing these bathrooms for years!" Yes, and I can imagine the cracked floors they've left behind. It'd be charming to think that First and Only Baths* can reverse the laws of statics to make it cheaper for me to redo my john, but me, I dunna think so. But as Mr. Estimator burbled away, I got to thinking: How much, really, of this job can I not do? Demolition only looks formidable when you think of it overall. But if you've got a good crowbar, the tile comes out in pieces. Ditto the bad plaster (if it is bad, that is). Same with the old linen closet. The bathtub, being such a mess, probably isn't worth putting on CraigsList. Wearing suitable protection and armed with a hefty sledge hammer, I could knock the bejeebers out of it quite handily. If I took things slowly and considered them well beforehand, I could cut and install the new cement backer board; maybe I could even sister the joists. Maybe, maybe, if I studied it out and got the right tools, I could also relocate the HVAC outlet and replace the plumbing lines for my lav and tub! Well, no, maybe that's too fantastic. I can imagine all that. 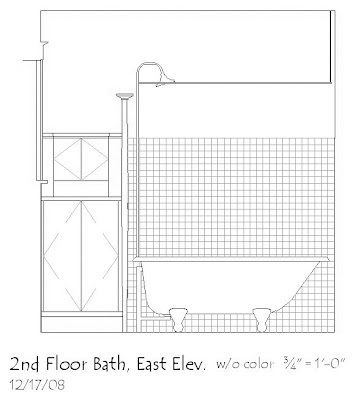 What I can't imagine is hiring First and Only Baths* to redo my second floor bathroom. As the kids a few years ago used to say, "In your dreams." Oh well phooey. I meant to make a post about digging two humongous holes and hauling tons and tons of old sandy dirt out and dumping tons and tons and tons of new compost and manure and peat moss and topsoil in, not to mention digging out the stump from the arbor vitae in the first place, and so getting two more roses planted yesterday (Wednesday) evening. . . But it took longer than I thought to download the pictures (haven't done it for awhile due to the computer being on the fritz). And then there's something I don't quite like about one of the roses. I mean, they aren't supposed to have funny markings on the leaves, are they? I have emailed the supplier. With photos. So there won't be a post. At least, not much of one. Haven't done any woodwork stripping since before Easter; the garden and the yard has demanded all my attention. I'm pleased to say that a lot of shrubs and perennials I thought were goners actually came through the winter alive. No pictures, though. My computer picked up a trojan and it's still not quite right. I don't dare post any photo files until I can make sure they're not infected. So that's where I am at the moment!